The #MeToo movement in India has finally made people stand up, take notice and take some action. Tanushree Dutta who first started the wave by naming Nana Patekar as her sexual harasser would be proud of the fact that she has started the ball rolling. 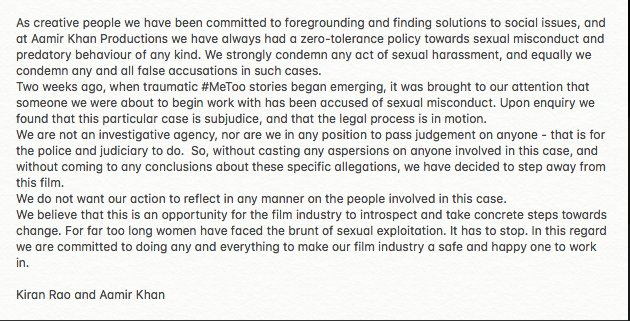 Phantom Films that was founded by Anurag Kashyap, Vikramaditya Motwane, Vikas Bahl and Madhu Mantena has dissolved because of grave sexual harassment allegations levied against Vikas. The allegations are such that the director has been losing work as well as face rather speedily. Today, Aamir Khan issued a joint statement with wife Kiran Rao saying that his production house has a zero-tolerance policy towards sexual harassment and misconduct. While he also attended a special meeting at Producer’s Guild to discuss the steps that can be taken up for making the industry a safe place for women to work in, he later revealed in the statement that he has decided to not go ahead with a big project that he was supposed to start work on because a person related to the project has been accused of sexual misconduct. In the statement that Aamir shared on social media, he wrote, “We are not an investigative agency, nor are we in any position to pass judgment on anyone-that is for the police and judiciary to do. So, without casting any aspersions on anyone involved in this case, and without coming to any conclusions about these specific allegations, we have decided to step away from this film.” At the trailer launch of his film, The Thugs of Hindostan Aamir was asked about Tanushree and Nana controversy and he had said, "Without knowing the veracity of something, it's not right for me to comment on it. But whenever something like this does happen, it's a sad thing. Whether this has happened, that is for people to investigate it." Reading between the lines one can deduce that Aamir Khan Productions must have been one of the producers in the project which was supposed to roll out soon but now the actor is no longer keen on the project and hence has deliberately withdrawn his support. As per the reports the director of the film had been accused of sexual harassment by a small time actress a few years back. The matter is still under investigation. 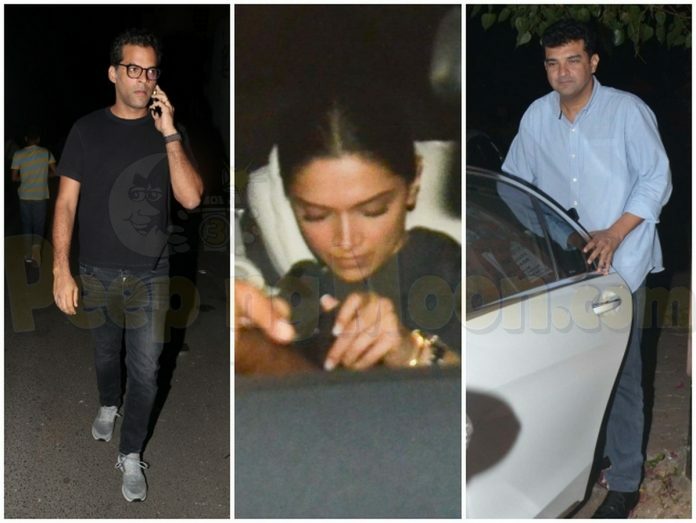 Last evening Deepika Padukone, Siddharth Roy Kapur, Rohan Sippy and Vikramaditya Motwane were spotted at Aamir’s residence. Although, the agenda of the meeting was not known but given the serious faces of all the celebrities present we’re sure that it wasn’t a happy get-together. Siddharth, Rohan and Kiran have become the members of the special committee in the Producers Guild that will work towards making women feel safe in the industry.